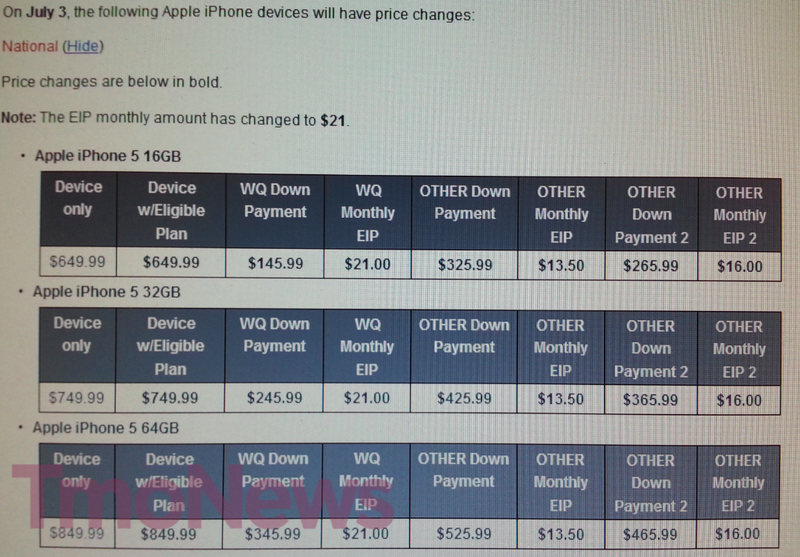 Beginning today, July 3rd T-Mobile is making some more changes to their iPhone 5 pricing with the reduction of the down-payment by $5 to $145.99 ($245.99 and $345.99 for the 32GB and 64GB sizing) and increasing the monthly equipment installment by $1. No reasoning was provided about why T-Mobile decided to make such a change or how long such a price would last. As for the “OTHER” pricing on the image, those numbers represent down payment and equipment installment price points based on various credit levels. This marks the second time T-Mobile has changed the phones pricing since the April 12 launch as the company unexpectedly increased the down payment from $99 to $149 back on May 13th. It’s still overpriced for a iphone soon to be outdated. Warning: This comment contains opinions. Bigger screen doesn’t mean better. It’s like saying, bigger tires. If that was the only difference I could agree with you, however, my comment was much more than just screen size. It does plenty more and with very little restrictions from Samsung, unlike Apple’s iPhone. Restrictions, restrictions, restrictions… I want to restrict Samesung and Google from selling my personal information, but I’m not given that option. Talk about a crucial restriction. I don’t want to be restricted to last year’s OS on a BRAND NEW PHONE (or tablet) without hacks. I don’t want to be restricted to app developers being allowed to harvest my info any way they please. I don’t want app developers harvesting my contacts for income opportunities (Facebook on Android). Oh, wait… that’s why I don’t buy Android devices. You really back up your argument with an Apple news site? Really? Do you really think an Android-centric site would publish the truth? You’re pretty gullible if you do. Besides, it’s not like the “Apple news site” did anything more than report the findings of someone else in the security business. Do you know how many tech sites there are that are not Android-centric? Cnet, All Things D, Ars Technica, Edgadget, Crunchgear, Gizmodo, Boy Genius Report, Slashdot, PC World, Tech Crunch, and Crave. I’m also shocked that the article didn’t bring up the fact that the only way to open yourself up is to go into the settings and choose to allow “unknown sources” to be installed on the phone. That means sideloading APKs from a place other than Google Play. If you download apps, other than Amazon app store, by sideloading then you deserve to get hacked. Yes, a 27″ TV can be better than a 60″ TV but I’d still take the 60″ over the 27″. I have been an iphone user for many years and I recently bought s4 instead of the iphone5 (renewed my contract) because i wanted to try it. I like many things about it. Its fast, and etc, etc. I like my phone. I use my phone a lot for playing games, and watching netflix. However, i’m regretting that i bought this phone because it heats up very quickly compared to my old iphone4. im not sure if its just my s4 or what. If im on the phone(playing a game, watching, or making a call) for more than 30min then i can really feel the heat which sometimes can be unbearable. I would like to hear from s4 users if it is the same to u all also and also from iphone5 users because may be it is normal to get hot since both the devices are very slim. My iPhone 5 doesn’t heat up unless I use it as GPS and leave on dash in sun. Only thing that ever really interested me in S4 was screen .. other than that, I love the reliability/quality and consistent updates of iPhone 5 and Apps. Gone through 4 Android phones (HTC EVO 4G, Galaxy SII, Galaxy Nexus, HTC One S…) Only one I really liked was Nexus.. Even then, wouldn’t go back. Wish HP had not so massively screwed webOS/Palm over. :( – I loved webOS.. Had cross device syncing Notification Center, Control Center, Card based multi-tasking, and other features way ahead of its time, iOS and Android.. Damn you HP! Now Android and iOS copying from the corpse of webOS, the irony! the irony I say! You get a lot more? How about usable FASTER internal memory? Oh, yeah… not happening (you get about 8GB out of 16). I’d rather have more usable FASTER internal memory than a bunch of useless feature that I’d probably never use. You do realize Android is a power hog, don’t you? That’s why these high-end Android phones NEED the higher specs. There are way too many factors to determine performance other than specs, but there are way too many people who can’t comprehend that. A friend of mine recently posted on Facebook that he’s already on his 4th GS4 since release day, since the first 3 failed in one way or another. The $699 is still overpriced for unlocked Galaxy SIII soon to be outdated. The $699 is still overpriced for unlocked Galaxy SIV soon to be outdated. They are very much correct. I use both unlocked iPhones and Android phones and keep watch of their prices. Before the SIII was sold unlocked in the US, it cost $799 to buy the international version. I’m guessing you mean the 32GB version. In a year, will you also deny the Galaxy SIV sold for $949? So they drop the down payment by $5 and add $24 in payments. Basically, they just raised the price by $19. It’s now the same $650 price that Apple/AT&T/everyone else charges. I really do regret not buying the iPhone 5 when it was $99 down. Considering the iPhone 5 has held up in torture tests better than many other high-end phones (Samsung Galaxy SIII and S4), I’d be surprised if it broke from jumping on it, unless he/she is wearing high heels. It makes me sad how there’s been no 925 news. You forgot to mention that they increased the price to $649 from their previous $629. I’m buying mine from Apple and getting my $50 iTunes gift card! Does T-mobile cover the Apple bought ones with their insurance? Yeah! you can have insurance on it from assurance just like on any other phone. Deductible will be $200 and $8 monthly. But if you buy from tmobile, apple store, walmart or anyother store…you have to purchase the insurance within 2 weeks i believe. Better off getting AppleCare+. 99 dollars up front and 50 dollar deductable. Or just doing the extended warranty and taking the Out of Warranty fee, which is much lower than Asurion deductible. That’s dumb. Even the S 4 and Note II are $175 deductibles. Maybe if you don’t tell them you bought it from apple. Sources? Personal experience Bought a google Nexus 4 and to get someone to do a warranty on it I had to say I got it from T-mobile but its better off from Google anyways because apparently they will give you a Brand New one at no cost. LTE always worked on the unlocked model of the IPhone 5 . If you are in an area with T-Mobile LTE ,before t mobile officially got the iphone if you bought an unlocked 1 from apple you would not have AWS 4G. If I remember correctly, the T-Mobile-compatible iPhones are unlocked and ready for use on other carriers? If not, it makes more sense to buy straight from Apple, especially now with the back to school promotion going on. That is incorrect. If you buy it from T-Mobile, they’re locked until you’ve fulfilled requirements for them to unlock it. That even applies if you pay full retail price. If you pay full retail price, you have to be a T-Mobile customer in good standing for 90 days before they’ll unlock it. What about prepaid then? There are different stipulations for each and they are not the same. They are correct that they are locked down when you buy them. You actually just proved their point and I don’t understand why you’d say they were incorrect, when you just stated they are locked at the point of sale. If it is purchased from Apple, it is SIM unlocked. Only when purchased from T-Mobile are the phones SIM locked. the iPhone is wayyyy too much. Apple needs to get with the program. At their price, I can buy several android or windows phones. Apple has always had a premium price on their devices. Look at the Macbook line and tell me they’re not inflated in pricing, but people buy them and Iphones and Apple keeps laughing all the way to the bank. WTF are you talking about? Nobody is even talking about used pricing of phones and you come in here saying we don’t know anything and then you go way off topic. Why are you even here? well you are also paying for the Apple stores all over the country as well as the support you can get. That’s one thing that keeps frustrating me with android. If I have a problem I’m out of luck and have to figure that out on my own. Most Mac stores were around before the Iphone, so that’s not a legitimate excuse. Another thing is that all the manufacturers have support numbers you can call and you are covered for a year, unlike Apple that if you are past 90 days you have to pay $20 to talk to an Apple rep or have Apple Care. A bunch of idiots with money to buy either brands well actually the z4 is awesome so I’ll exclude that but everything else is crap. I guess you have a BMW and an iPhone and speak from experience right? i am reading the post and no one has mentioned the most important thing about this change tnobil has broken the 20 dollar barrier who know where that goes from here don’t want to see prices go to 25 and 30 dollars a month. i guess it not surprising to see them play with prices to increase sales. i have noticed my note two with 3 different values sense they started this. who determine the the true value do we need a kelly blue book for phones to get the fair price? As long as they keep lower options whats the problem? You are financing the phone only. Why do android fanboys feel the need to come onto every iPhone post and attack Apple and the iPhone? It’s getting really old. Use what you like and stop attacking people who choose something different. Typed on my iPad while texting on my HTC One S to my partners Windows Phone. Apple fanboys do the same to every Android article. And HTC fanboys to Samsung articles and vice-versa. It’s just how fanboys are. It’ll never change. Because they’re typically not worth fighting over, except for the bargain basement prices. Hardly. Android flamers pop up ten fold compared to iOS flamers. Your comment below invalidates your opinion. Could be it is due to there being ten fold Android users worldwide compared to iPhone users. But they are buying the phones in bulk so it is much cheaper for them. No they don’t. Apple dictates the pricing that carriers pay for them and they don’t get a discount. That’s why Sprint and Verizon took 600 million dollar or more hits in their profits, compared to previous quarter, when the Iphone starting selling on their networks. T-mobile makes money on Android phones but they’re not making money on Iphones. That’s the reason T-mobile didn’t start carrying them until they made customers pay retail pricing on phones. I don’t think anyone believes the reason why T-Mobile USA didn’t have the iPhone until recently was because they wouldn’t make any money on it. No, they would have lost hundreds of millions on it. That’s why they didn’t carry the phone until they got rid of subsidies. Interesting how they have steadily increased the price. Wonder if it has something to do with losing money, perhaps due to scammers and fraud. A lot of people flocked to T-Mobile for cheap iPhones. Inside T-Mobile you see the third world, foreigner opportunistic thinking that goes into the pricing and product development decisions. Sometimes it reeks of the Ganges. Selling it and buying a new one is it. Find a friend or an acquaintance that might want one. I love to read all this dog fight , iphone is beautiful , and userfriendly ios make this phone great , technically way behind but performance is super …thats why apple make monopoly …no such type of any device can beat iphone…..by the way I m android person. This guy is an idiot! He is on Sprint’s facebook page saying T-Mobile is more expensive than Sprint! WTF! Clearly he didn’t compare rate plans! Directors like John who hasn’t done a single positive thing for the organization, employees or customers. He is still sitting ideal replacing hard working employees with his buddies, collecting large salary and bonus for all his corruption and discriminating activities. It is very important for any organization to be honest to its own employees to be successful.